Steve Purcell is a comic genius in every sense of the word. His expressive drawing, witty dialogue, absurdist humor, sight gag-crowded backgrounds, and breakneck pacing make the adventures of his cheerfully trigger-happy funny animal private eyes a treat for every reader, even—maybe especially—those readers not already steeped in the medium. It's no wonder the characters translated so well to animation. At the time I bought this issue, I was carpooling with a co-worker who was kind enough to swing by my LCS on our way home every couple of weeks. Most of the time he was indifferent to my purchases but he was intrigued enough to borrow Sam & Max. Before I knew it, half the office had read it. One enterprising soul even set Purcell's absurd "Manatee Song" to music and sang it at that year's Christmas party. It was one of the rare moments when the comics side of my life (which I usually kept on the downlow) and the rest of my life converged. For that reason alone, it deserves a spot on my list. 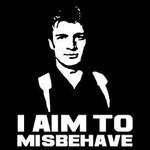 But mostly it's here 'cause it's just so damned funny. I summon the four-color upper! Last Edit: Dec 20, 2014 14:58:30 GMT -5 by Cei-U! Memories are funny. I thought that I discovered the Claremont/Byrne/Austin team with X-Men #111 but it must have been this magazine-sized comic that was released the previous summer. I didn't own this one for a long time; my older brother had it and I desperately wanted a copy of my own (I eventually got the inferior color reprint and, later still, the original magazine edition). At the time I was reading everything by Robert Heinlein I could get my hands on so when I learned that this was Claremont's homage to the 'dean of science fiction writers' - and that it was wonderful - I had located the nexus of my comic book and science fiction nirvana. Damn good black and white art too. I have no idea 38 years later what possessed me to buy this comic. I wasn't a Superman fan and had no idea who the Hell any of the other characters were. But I bought it...and even though it didn't make 100% sense (the story) to my my 8 year old brain, I was hooked. I got the idea of the multiverse in seconds and was a huge fan of all things Earth-2 until the Crisis inexplicably destroyed it. After that I still tended to try out things with those Golden Age characters, but with a few exceptions (the short Justice Society run by Strazewski and Parobek) it was never the same. But this book and JLA 135, which came out the same month, shaped my comic buying and my back issue collecting for over a decade. I grew up with my father's comic collection, and although it consisted mostly of Batman he also had a smattering of X-Men, Spider-Man, Hulk..and to my sheer joy Marvel's full run of Star Wars comics! So although I missed the boat on the original trilogy my young childhood was not bereft of Star Wars, indeed the 90's were a perfect time for me as I soon got into Dark Horse's line of Star Wars books and there were a ton of great paper back novels as well. On top of that the films were re-released in the cinemas with new special effects and while I was annoyed that Greedo shot first I generally enjoyed seeing Dewbacks and other strange creatures. And Then, just when I thought it couldn't get any better the prequels were announced! And that is why I picked this comic strip/magazine, it wasn't my first experience with a Star Wars comic, nor the first comic I bought with my own funds but it was here that I first heard about the new Star Wars movies and so it will always be cemented into my mind. But my personal history aside this was a cool book in its own right, it featured interviews with the actors from the original trilogy which was really cool, pictures of stuff from Episode One, concept art by Ralph McQuarrie from the original trilogy and explanations from him about how things changed from page to film, choose your own adventure novellas and of course an awesome comic strip. 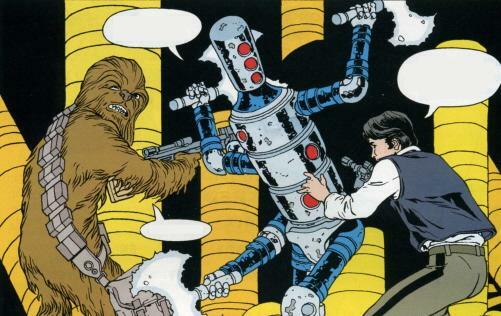 Like I said, this was far from my first Star Wars experience and although the Marvel comics explored the days after the Death Star's destruction the fact that this comic appeared in a magazine with interviews with the actors from Star Wars and even George Lucas made these comics feel official. Beyond that, I also liked the art here much better than the Marvel or the Dark Horse issues; I was already a fan of Mike Mignola's art at this point and I loved the minimalistic and highly stylized look that Gary Erskine's art gave the Star Wars universe. They were similar enough to the actors who portrayed the characters but simplistic enough that I felt like I could copy the look myself(though my sketches never looked that good). Oh, and if you missed the boat on these strips they are also collected(along with the really great Marvel UK strips) in the Star Wars:Wild Space omnibus. 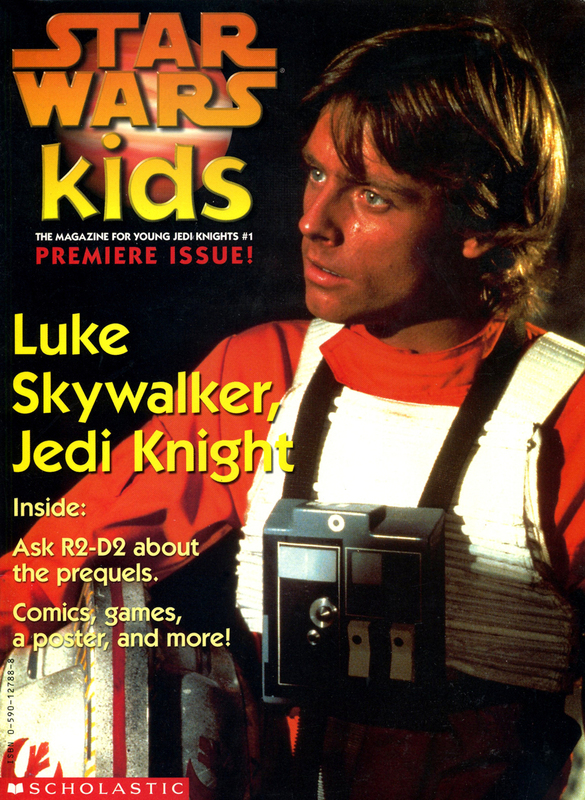 You list five issues of Star Wars Kids, which is against the rules. Which one should I count as your pick? 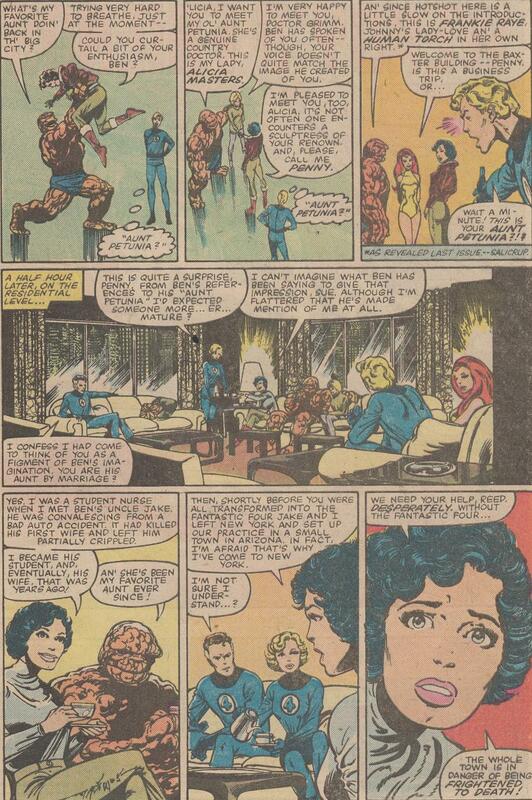 At the behest of Ben's "Aunt Petunia" (who finally appears for the first time in this storyline after many years of Ben referencing her), the FF travel to a small Arizona town where the citizens apparently are being frightened to death. What they find is something inexplicable - small shadowy creatures that swarm nightly and whose purpose can only be speculated about. There is a subplot of a young girl named Wendy who is abused by her alcoholic father, which hit home with me (not exactly the same situation, but close enough to relate.) I reveled in Frankie Ray's response to the situation, but Reed was not happy about it. 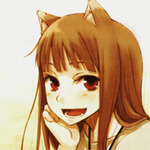 In the end, there is nothing they can really do, which was different from most stories. Why this one? Because Spidey wouldn't give up. This was one of the first back issues I ever picked up when I started collecting Amazing Spider-Man, because I was intrigued by the idea of him facing off against the Juggernaut, who outmatched him in every way, shape, and form. As I read the book, I couldn't believe that Peter just kept going, refusing to back down, refusing to acknowledge that his chances of winning were slim, and refusing to quit. It was one of those "I can't believe I'm reading this" moments for me, but it was really believable in terms of the character. Steve Purcell is a comic genius in every sense of the world. His expressive drawing, witty dialogue, absurdist humor, sight gag-crowded backgrounds, and breakneck pacing make the adventures of his cheerfully trigger-happy funny animal private eyes a treat for every reader, even—maybe especially—those readers not already steeped in the medium. It's no wonder the characters translated so well to animation. I have the Sam and Max Surfin' the Highway TPB, and I probably read it at least once a year. It's absolutely brilliant. 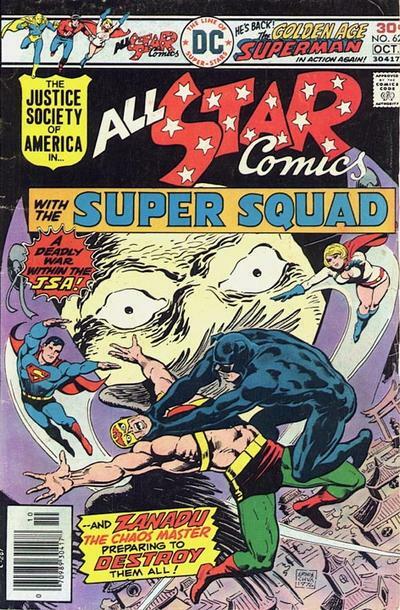 The reason today's pick makes my list is simply because it was the first proper U.S. comic I ever owned. In Britain in the '70s and early '80s, comics were basically black & white. Sure, 2000 AD would have a couple of pages in colour and the likes of the Beano or Dandy would sometimes utilise a duo-tone palate, but the vast majority of comics published here in the UK were black & white, except for their covers. As a young kid, I just accepted this because I knew no different. Comics were black & white and that was that! At some point in late 1982 or maybe even early 1983, I walked into a discount and reject store in my hometown and discovered racks full of cheap American Marvels and DCs....and they were all in colour! It's impossible to overstate what a revelation this was for me. It was like someone removing the blinkers from my young comic reading eyes. It was like suddenly going from grainy, early 20th century newsreel footage to High Definition colour. I was blown away by the fact that here we had comics that were in colour from start to finish, on every page! Colour comics, for Heaven's sake!! Who woulda thought it?! Anyway, over the next few years I bought a fair few American comics from this particular store, until it shut around the end of 1984 (by which time I'd found another local newsagents shop that also stocked U.S. comics). The story in this issue is a pretty enjoyable team-up between The Thing and Spider-Man, as they battle an inept street conjurer who has suddenly become possessed by an evil sorcerer from another dimension. I'd never say that it was a classic issue or anything, but it will always have a special place in my heart for being my first experience of reading a full colour U.S. Marvel comic. Sorry, I posted the cover to the first but decided to list the issues that contained the rest of the strip I chose for the sake of anyone that might want to read this story. I guess it could have been clearer that I meant the first issue which is where I first learned about Episode I. This issue came from waiting to pick up my dad at the airport. The cover was a carnival barker and freaks behind him, which was always fascinating. I didn't know the characters except I think I had a reprint of the Avengers tangling with the X-Men, because I seem to recall recognizing Cyclops and Magneto. I read this and re-read it. It was beautiful. Cockrum and Austin on a classic cover and Byrne/Austin inside with a great Bronze Age X story. 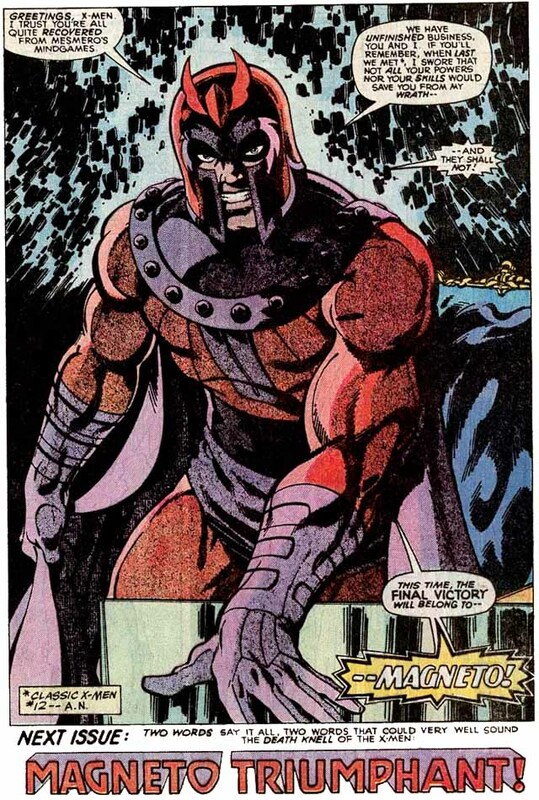 and that last page with Magneto ! Who could look at that and not be blown away ? Synopsis: Ms. Tree investigates the murder of Dominique Mureta, the current head of the Mureta crime family. 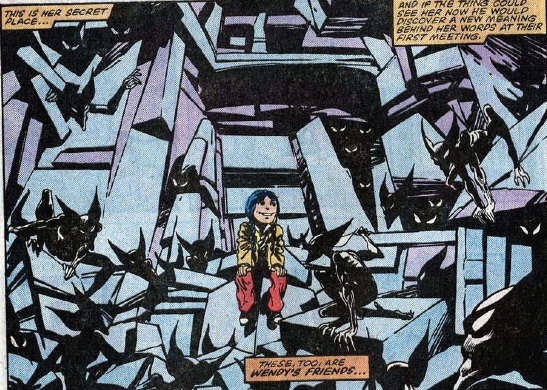 Why I chose it: This comic was my introduction to a character who has become one of my favourites. I had vaguely heard of heard of Ms. Tree, but had never read any her comics. However, when DC started producing this book (during its experimenting with re-introducing quarterly books in the early 90s), something made me pick up the first issue. I'm sure the awesome Mike Grell cover had something to do with it, as did the Denny O'Neil Batman text story that ran as a back-up feature. 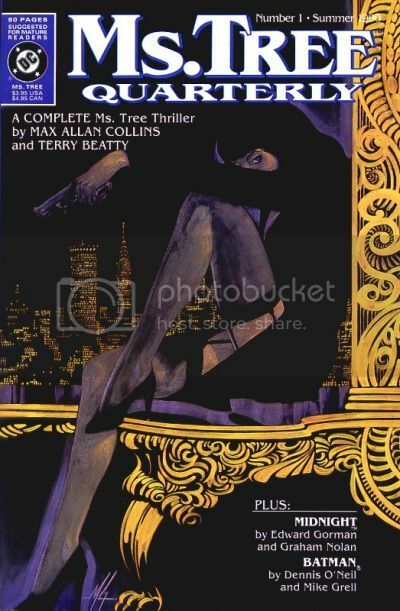 But I was quickly hooked on Ms. Tree herself: a well-written hard-boiled detective story with a strong female protagonist and a fascinating supporting cast. I bought the rest of the DC run as it came it, and then started hunting down the back issues of the previous series (still not complete I am very close to having a complete run). And I think the Quarterly stories were the perfect format for the character. The bigger page count allowed for the stories to be 'done-in-one' (while still having ongoing subplots) and the stories were in full-colour for the first time. And the Ed Gorman/Graham Nolan 'Midnight' back-up strip was excellent as well. So Barbarian was my gateway, but I choose this special issue because it is THE most memorable Conan comic I ever read. It holds everything I love about Conan, all within that sequence where, crucified, he never gives up, using his courage, spirit, and sheer strength to overcome the insurmountable. Man that just melted my brain when he ripped that vultures throat out, and I never recovered, dozens of paperbacks followed, Frazetta art books, hundreds of comics, and airbrushing Frazetta and Boris paintings (poorly) in a vain attempt to emulate my heroes. More than comics, more than books, or even the movies, Conan added so much to my life, God even if it was just the introduction to Frazetta that I thank him for, then that alone is worth this entry. But its not, by finding these other artists through my love for this barbarian, it encouraged me to stretch my skills, to strive to be the best artist I could be. Ms. Tree was an awesome book, definitely one of the best books from the 90's! 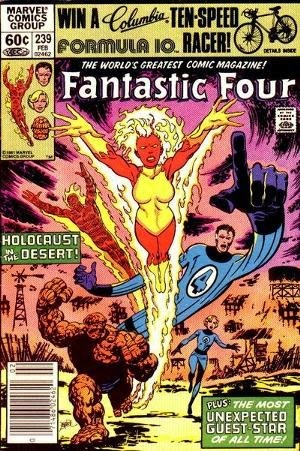 Who's the female human torch? ?